Those I had ordered last year and planted are well established and thriving. Plan to order more still to fill out the area. Overall very pleased with my purchases. Creeping Phlox is a great plant to consider, especially when just introducing yourself to gardening. Creeping phlox, also known as Phlox subulata, are perennials which have clusters of aromatic flowers. These flowers bloom each spring and come in many different colors, spreading outward, rather than up. This makes creeping phlox an excellent choice for providing not only a splash of color but also ground cover for gardens. Creeping phlox is known to be resistant to deer and does well in drought conditions, making it a relatively low maintenance addition to yards. Another nice feature of creeping phlox is that its flowers attract butterflies. As creeping phlox spreads, it can also be divided up and easily transplanted to different areas where more ground cover is desired. Creeping Phlox comes in various colors. The Creeping Phlox is a ground covering plant. It grows well over rocks and dead plants. The plant can have a width of up to two feet. The phlox will bloom in clusters of purple flowers. These clusters often have a pleasant scent to them. The clusters may be notched, narrow, or rounded in shape. They are light purple and are very pretty to look at. Creeping Phlox requires little knowledge or knows how to plant or take care. This plant is mostly used as a ground cover and almost looks like a carpet in your garden. The flowers and leaves cascade over the ground in the most spectacular way. The colors of the flowers are almost pastel and quite beautiful. You can even use this plant in rocky or harsh soil conditions as it will do well, and it will bring color and beauty to an otherwise dull and bland area of your yard or landscape. Another great thing about this ground cover plant will come back every year to fill your garden with color and wonder. It almost even has a semi-evergreen nature to it, lasting most of the year depending on conditions. They vary from lavender to pink and sometimes white or bluish-purple. The flowers are most beautiful because of their five points, making them look like stars. The leaves resemble needles in their shape and are slender. The thicker this ground cover grows, and the blooms may taper off. However, you can cut the older parts of the plant out, and this will encourage new flowers and new growth bringing the life back to this beauty. Add to any yard or landscape for a beautiful look. As said before, care and maintenance for this particular plant are relatively simple. The plant is a natural grower and can thrive in many different kinds of soil conditions and environments. In fact, almost any soil conditions can sustain this ground cover. For optimal results from this ground cover, plant in a very sunny area where the soil is well drained but moist. You can even add fertilizer and organic ingredients to the soil to enhance the plant’s growth and overall health. It will be especially helpful when the plant is first put into the ground and will help it become established more quickly. When planting Phlox, you only need to plant it at soil level and be sure not to bury the stem in the ground. By following these simple care and planting instructions, will lead to many years of enjoyment from this beautiful ground cover. Regular care for this plant is also low maintenance. Extra watering may also be required if the conditions are sweltering and even for these that you plant in rocky areas as the heat from the rocks may be harsh on the plant. After this ground cover has flowered and bloomed for the year, you can cut the stems back, and this will encourage a second growth from the plant. Cutting this plant again during the later winter months is also recommended and will help to promote a newer growth with younger and more beautiful stems and blooms. Check for mites or other insects has infested the plant. If they do, merely apply an organic insecticidal soap to rid the plant of these creatures. In addition to the low maintenance and extreme beauty that this ground cover will provide, you can also separate this one very quickly and move it to other parts of your garden or yard. To do this, just dig up the part of the plant you have separated from the rest and make sure you keep the roots intact. Divide by cutting through the center. 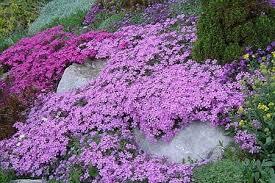 Creeping Phlox as well as help you add color in other areas of your yard at no financial cost to you. Creeping Phlox is also exceptionally hardy and does very well in climate zones three through nine. The blooms on this ground cover will appear during spring and summer months, but some have been known to bloom on into early winter depending on conditions and the climate in the area. This plant is also known as moss phlox or moss pink to some and can grow to be a substantial size when adequately planted and taken care. This plant is a perfect choice if you are creating a rock garden or if a slanted area. The phlox will form its carpet of beauty while also acting to help prevent and control erosion-prone regions of your yard. Not only used as a ground cover, but this plant is also perfect to use for ordering. It looks great when planted along sidewalks or other walkways and around your garden or natural area. It is also exceptionally visually striking when planted in mass groups and even does well in container gardens. It is easy to control and grow, making it the perfect plant for any home. Plant during spring or fall months and they need to grow up to 18 inches apart to give them ample space to establish their root systems. Until established water, until they become established and begin to grow. Some species of this ground cover may need some much when first planted, consult your local nursery when deciding on what species you are wanting. Adding a fresh look to add to your natural area, Creeping Phlox is an excellent choice. Adding fresh and colorful plants to one’s yard, you can create an ambiance that is peaceful and relaxing. Homeowners want a look that is fresh and peaceful and adding new plants can do that. Creeping Phlox bring new life and a clean look to any area that grow. A creeping phlox would be great to add to your yard. With its bright colors and being able to spread is great for your yard. It could easily help you cover bald spots in your yard. Plus it also a great eye catcher. It looks great anywhere, and it is adaptable. If you want some of this creeping phlox you need to get some you won't regret it. Creeping Phlox is a beautiful ground cover. It can grow to be around 6 inches tall and can spread to be 24 inches wide. One of these plants will cover a lot of areas, so you need to plant them at least 12 inches apart. They will thrive in full sunlight and will also do great in various soils. The creeping phlox even does great in the poor quality soil. The flower can also come in shades of blue, pink, or white. These flowers will stay in bloom for several weeks. During the colder months, this plant will remain green in color all year round. The flowers will bloom in the late springtime to the early summer.